Tofu is not just for vegetarians! Everyone can enjoy it and it’s healthy for you too!! 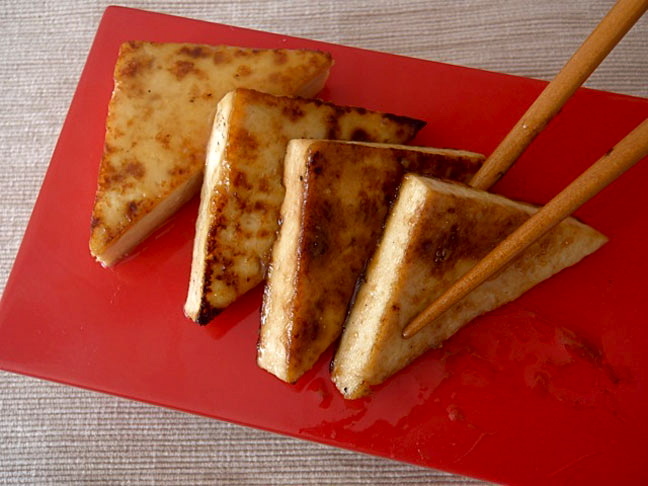 Tofu is quite porous and therefore easily absorbs flavors. Miso is one of my favorite Japanese flavors — probably because of its sweetness (which is I think why my boys like it, too)! a highly nutritious, protein-rich food. So this snack (or side dish) is quite healthy and delicious! Add a vegetable and enjoy it over brown rice for a great, complete meal. It would also be perfect with Sesame Bok Choy. Oh, and here’s a good tip: save the marinade and spoon it over the tofu when it’s ready! In a shallow baking dish, use a whisk to combine the Mirin, soy sauce, and miso paste. If the miso is a bit too firm to blend, you can warm it slightly in the microwave first, for about 10 seconds. Slice the tofu block into approximately 1/4-inch slices and then cut those in half, into triangles. Add the tofu triangles directly to the marinade as you cut them, flipping them once to coat both sides. Let them sit for about 15 minutes. Heat a large saute pan with enough oil to coat it. Add the tofu to the pan — you should hear a sizzle. If you don’t hear the sizzling sound, wait until you do, or your tofu will not brown and caramelize. Cook each side until nicely browned, about 2 minutes each. Mirin (a sweet rice wine) and miso paste are both available in Japanese markets — and often in the Asian section of larger markets. Grape seed oil is a wonderful choice. It’s very low in saturated fat, has a high burning point, and doesn’t interfere with the other flavors. It’s my first choice when I cook with Asian flavors.